Minimum Bachelor’s Degree in information Technology/Computer Engineering/Computer Science or equivalent degree from recognized university with minimum 45% marks or 2.75 CGPA. 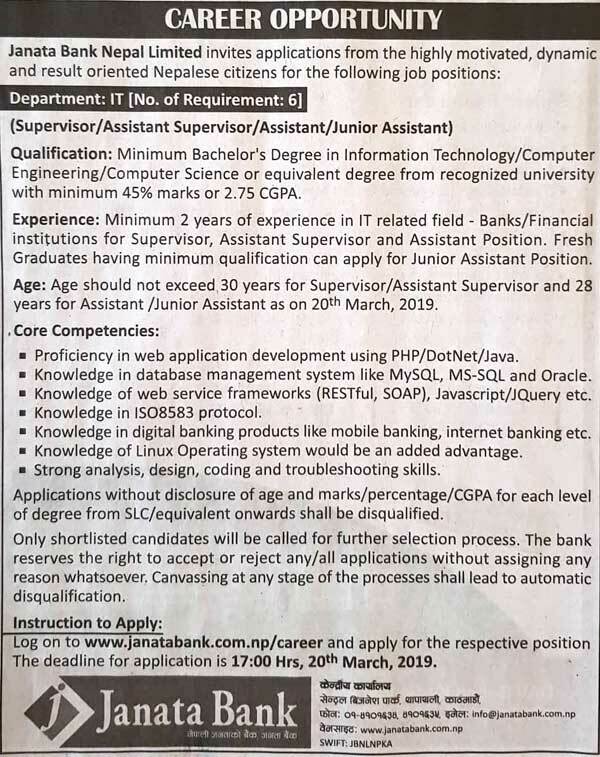 Minimum 2 years of experience in IT related field – Banks/ Financial institution for supervisor, Assistant Supervisor and Assistant Position. Fresh Graduates having minimum qualification can apply for Junior Assistant Position. Age should not exceed 30 years for Supervisor/Assistant Supervisor and 28 years for Assistant/Junior Assistant as on 20th March, 2019. > Proficiency in web application development using PHP/DotNet/Java. > Knowledge in database management system like MySQL, MS-SQL and Oracle. > Knowledge in ISO8583 protocol. > Knowledge in digital banking products like mobile banking, internet banking etc. > Knowledge of Linux Operating system would be an added advantage. > Strong analysis, design, coding and troubleshooting skills. Applications without disclosure of age and marks/percentage/CGPA for each level of degree from SLC/equivalent onwards shall be disqualified. Only shortlisted candidates will be called for further selection process. The bank reserves the right to accept or reject any/all applications without assigning any reason whatsoever. Canvassing at any stage of the processes shall lead to automatic disqualification. Log on to [ LINK HERE ] and apply for the respective position the deadline for application is 17:00 Hrs, 20th March, 2019.